Gran Bahia Principe Jamaica is our Platinum Weddings in Jamaica resort. They have become the most popular destination wedding location in Jamaica for one reason - they deliver perfection! Weddings at Bahia Principe Jamaica have become our clients' favorite destination wedding location in Jamaica for several reasons. One reason is the location of the wedding itself; at most resorts there is the agonizing decision to make over whether to get married on the beach or in the wedding gazebo. The wedding gazebos tend to be beautiful, but you traveled all the way to the Caribbean to get married so you could have the views of the those beautiful Caribbean blue waters in the background. With Bahia Principe Jamaica weddings you don't need to make that choice as their luxury wedding gazebo is located directly on the ocean. Their wedding location offers stunning views mixed with a traditional cobblestone aisle for the bride to walk. This is truly one of the most remarkable exotic wedding locations we've seen. The second reason for the popularity of Gran Bahia Principe Jamaica is that there is no other location in Jamaica that offers such an amazing mix of beauty, service, food and value. Your money just stretches a little further at this resort than other 5 star resorts in Jamaica and you cannot beat the service that they provide. 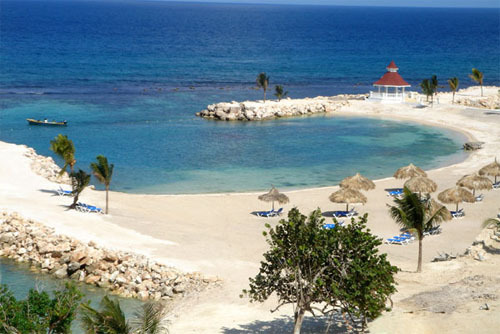 The beach at Bahia Principe Jamaica weddings looks over the beautiful crystal waters of Runaway Bay. The beach encompasses two inlets that offer incredibly calm waters for swimming and water sports. The other aspect of Jamaican beaches that many clients like is that they are private. While you are only able to walk the beach in front of the resort grounds only the guests at the hotel will be on the beach. Your guests won't soon forget the wonderul local and international cuisine they experienced at your wedding in Runaway Bay. The level of food served at Bahia Principe Jamaica is definitely five star and with four a la carte restaurants, a beach restaurant and a buffet restaurant, even the pickiest eaters will find something to satisfy them. The Bahia Principe chain has very wisely realized that the best way to a client's heart is through their stomach. Guests at Bahia Principe Jamaica weddings stay in very well appointed Junior suites. Equipped with either one King size four poster bed or two double beds, these rooms are very comfortable. Given the layout of the resort, many of the rooms are oceanview as well. When planning Bahia Principe Jamaica weddings we always upgrade our bride and groom to a higher section of the hotel if possible. Note that these upgrades are based on availability. If you decide to have your wedding at Bahia Principe Jamaica in Runaway Bay you can rest assured that you have picked an awe-inspiring location. The problem with many all inclusive beach weddings is that you risk having passers-by end up in the background of your photos. With the very smart location of their wedding gazebo, this will not happen to your Runaway Bay wedding photos. Bahia Principe Jamaica Weddings go off like clockwork because of the amount of work we put in and our unique relationship with this hotel. Any problem that does pop up we can get on the phone and get it resolved, usually without anyone even noticing. There are event coordinators that we work with onsite who are truly accomplished professionals. At Bahia Principe we offer civil Jamaica weddings (legal all over the world), Catholic weddings, Jewish weddings and symbolic ceremonies. Whatever you're looking for we can create the perfect Caribbean beach wedding for you with one of our Bahia Principe Jamaica Weddings. 1. Remember that if you book all of your rooms through All Inclusive Resorts we will take care of your Jamaica wedding planning for FREE. 4. Basically, we'll do everything we can to make sure that your wedding at Bahia Principe Jamaica is the day you've always dreamed of. 5. Working with Victoria for your Beach Wedding in paradise is a win-win situation. You get the lowest prices on your rooms and personalized wedding planners to walk you through all the ins and outs of planning a Caribbean beach wedding. Imagine that, Bahia Principe Jamaica weddings and FREE destination wedding planning. 6. Warning: Jamaica wedding dates start to disappear over a year in advance. Ask us about securing your wedding date with the hotel right away. Give us the word and we'll lock up a date for your Bahia Principe Jamaica weddings. Ask us to Price your Bahia Principe Jamaica weddings today and we’ll start the process of making your dream wedding in paradise a reality. Note that all wedding packages are paid directly to the hotel during your stay. Wedding packages are subject to change by the hotel without notice. We do not mark up Bahia Principe Jamaica Weddings packages at all - they are all paid locally. All wedding packages are for 20 people with a small supplement to be paid per additional guest. Ask us for the supplements once you've decided on a resor. •Decoration of the location; the wedding location will be assigned alter arrival. •Bridal bouquet and buttonhole for the Groom. •Dinner in one of our restaurants with set menu (consult menus) and traditional wedding cake. If you instead wish to choose a dessert from our menu rather than the traditional wedding cake, you may choose between: Raspberry cake, Chocolate cake, Coconut cake or Coffee with white chocolate cake. •Upgrade for the Bride and Groom upon availability. •Upon arrival local sparkling wine will be served in the room. •The wedding may be celebrated on the beach, this special assembly is available for the ceremony and for the dinner (the ceremony can be celebrated on the beach and dinner would take place in Piscis Restaurant). •This is an “all inclusive” offer. •Other additional personalized options are available (Ask Wedding Coordinator for current options and prices). •Decoration of the location; the wedding location will be assigned after arrival. • Or special wedding cake, you may choose between: “De Luxe cake” and “Love cake”. •Floral arrangement on the bridal table. •Upgrade for the Bride & Groom upon availability. •5 pictures of the wedding. • If the Bride decides to get her Wedding Hairdo at the Hotel's Hair Salon, the Trial Hairstyle is complimentary. •Upon arrival sparkling wine will be served in the room. •The wedding may be celebrated on the beach, this special assembly is available for the ceremony and for dinner (the ceremony can be celebrated on the beach and dinner would take place in Piscis Restaurant). •Wedding certificate will be sent aproximately 3 months after the wedding. •Floral Bouquet for the Bride (to be chosen between various options) & buttonhole for the Groom. •Celebration with Möet chandon champgne. •Dinner in one of our restaurants with set menu (consult menus) and traditional wedding cake. If you instead wish to choose a dessert from our menu rather than the traditional wedding cake, you may choose between: Rasberry cake, Chocolate cake, Coconut cake or Coffee with white chocolate cake. •Or special wedding cake, you may choose between: “De Luxe cake” y “Love cake”. •Floral arrangement on Bridal table. •Upgrade for wedding couple upon availability. •10 pictures of the wedding. •2 SPA Relaxation Circuits (check availability in the hotel). •Upon arrival Champagne bottle will be served in the room. •Special breakfast “Day after wedding” will be served in the room.